Constructed during the mid-1970s, the Namhung Industrial Area was always intended to be a center of industrial activity. The majority of this activity was centered on the Namhung Youth Chemical Complex—the nation’s “premier petrochemical processing complex.” Throughout the late-1970s and 1980s the area increasingly fulfilled its intended role. During the 1990s, as a result of economic collapse, famine and floods, the Namhung Industrial Area witnessed a dramatic downturn in overall production and many components fell into disuse. Beginning in 2005, a program was initiated to construct an anthracite gasification plant within the Namhung Youth Chemical Complex (see article) and revitalize the entire Namhung Industrial Area. Since then significant progress has been achieved. 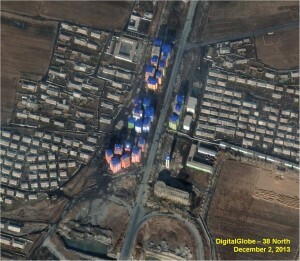 Satellite imagery during 2012-13 shows constant activity throughout the Namhung Industrial Area, with rail cars moved and loaded, smoke and steam emanating from smokestacks and vehicular traffic. Accompanying this activity has been numerous construction and refurbishment projects, including work on 26 new high-rise apartment buildings. This activity confirms that the facility is operating at a higher level than in the previous ten years and strongly suggests that the complex will continue to expand. The Namhung Industrial Area can be separated into five separate locations: the western industrial complex (A), central industrial complex (B), Namhung Youth Chemical Complex (C), housing, support and defense area (D), and eastern industrial complex (not pictured). Figure 1. Namhung Industrial Area Overview. Western Industrial Complex: This area (A), covering approximately 634,500 m2, can be divided into five functional sections: two water/waste treatment plants (A1 and A2), a steam generation facility (A3), a furniture/wood products plant (A4), an industrial complex (A5-A14); and a railroad classification yard (A15). On the western side are two water/waste treatment plants, covering approximately 135,000 m2 and 59,000 m2 respectively, that provide service to this area and possibly the entire Namhung Industrial Area. Adjacent to the northern treatment plant is a coal-fired steam plant that covers approximately 18,000 m2 and provides steam to various plants in this area. It is serviced by a 1.8 km rail line and may also contain a small thermoelectric plant. In the center of the western area is a rail-served lumber storage facility and wood products/paper plant covering 45,000 m2. By far, the largest component of the western area is a rail-served industrial complex (A5) covering approximately 301,000 m2. The majority of this complex consists of the Anju No. 121 Paper Factory. Visible are, what appears to be, a rotary kiln (A6), storage silos for raw material and by-products (A7), storage tanks for chemicals (A8) and a tall smokestack (A9) at the center. Aside from the production buildings, the industrial complex contains administration buildings (A10), a cultural welfare facility (A11), rail loading facility (A12), power substation (A13) and a fish farm (A14). The railroad classification yard south of the industrial complex is the primary rail facility servicing the entire Namhung Industrial Area. This yard was electrified sometime between 2006-10 as part of a general rail electrification program for the region. Rail cars arriving or leaving the Namhung Industrial Area are sorted here and moved within the area by diesel switcher. Sometime during 2009-10, what appears to be a new rail engine servicing facility was constructed within the Namhung Youth Chemical Complex. Figure 2. Western Industrial Complex Overview. Figure 3. Western Industrial Complex Detail. Central Industrial Complex: The function of this complex (B), covering approximately 404,000 m2, is unclear. But a portion may be involved in furniture or wood products production while other areas could be engaged in the production of preformed cement/concrete components. 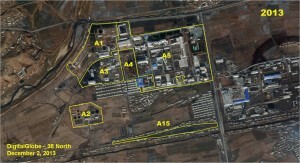 This area is served by a .9 km long rail line and consists of numerous small fabrication and support buildings, headquarters/administration buildings (B1), a power substation (B2), a rail-served gravel/sand/cement unloading facility (B3), a possible batch plant (B4) and two small retention or fish ponds (B5 and B6). Figure 4. Central Industrial Complex. Housing, Support and Defense: Surrounding the Namhung Industrial Area are a number of housing, support and defense-related facilities. Until 2012, the housing areas consisted primarily of smaller single-story two-family housing units (D1-D7). Since 2012-13, a new modern housing development consisting of 26 high-rise (D8) and four possible office buildings (D9) has been constructed on the southwest side of the Namhung Youth Chemical Complex. This development is suggestive of either a significant increase in the welfare of existing workers or a growing workforce for the area. There is also a water/waste treatment facility located on the east side of the Namhung Youth Chemical Complex (D10). While the area is well integrated into the national air defense network, an air defense artillery regiment directly protects the Namhung Industrial zone. 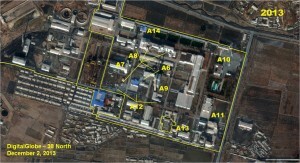 There are seven battery-level sites within 4 km of the center of the facility—three of which are visible in the imagery presented here (D11-D13). 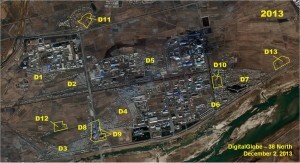 The Korean People’s Army’s 37th Nuclear-Chemical Defense Battalion’s is reportedly stationed at the Namhung Youth Chemical Complex. The precise location of its barracks is, however, unknown. Figure 5. Namhung Industrial Complex, Housing, Support and Defense. Figure 6. Namhung Industrial Complex New Housing Complex Detail. This overview was written by Joseph S. Bermudez Jr. who is the Co-founder and Chief Analytics officer of AllSource Analysis, Inc. Find related article here.